The European card game Poch is at least 500 years old, and is still played in Germany under the name Poch, Pochspiel (the game of Poch) or Pochen. It has been known by a number of similar names, such as Bock or Bocken in Germany and Bog or Poque in France. The current Icelandic version Púkk is described on another page of this site. 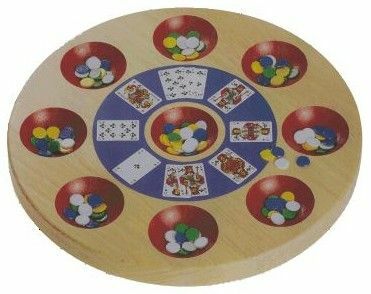 Variations of Poch are played in North America under the names Tripoli and Three in One, and boards are sold there under various proprietary names: Tripoley, Rummoli, Michigan Rummy, etc. A detailed early history of the game can be found in an article by Thierry Depaulis: "Pochspiel: An 'International' Card Game of the 15th Century", published in The Playing-Card (Journal of the International Playing-Card Society) in three parts, in Vol XIX No 2 (Nov 1990), Vol XIX No 3 (Feb 1991) and Vol XIX No 4 (May 1991). On this page the modern German form of Poch is described first, based on rules supplied with a modern board, on various books, and on information from Jan Böttcher. There follow summaries of differences in the 18th and 19th century versions of the game. If a ready-made board is not to hand it is fairly easy to make your own. You need places for the nine pools: Ace, King, Queen, Jack, Ten, Marriage (marked King-Queen on the board), Sequence (marked 7-8-9 on the board), Pocher (marked with a Joker on the board) and the centre pot (unlabelled). The first dealer is chosen at random and the turn to deal passes to the left after each hand. Before each deal, every player must put one chip into each of the nine pools. The dealer deals out the cards clockwise, one at a time, and places the last card face up on the table. Unless there are three players. Some of the players will have one more card than others: this does not matter. The last card belongs to no one; the suit of this card is the "pay suit". The players who hold the Ace, King, Queen, Jack and Ten of the pay suit collect the chips from the relevant pools. If one player holds the King and Queen of the pay suit, that player takes the marriage pool. If one player holds the Seven, Eight and Nine or the pay suit, that player takes the contents of the sequence pool. In many deals no one wins the Marriage or Sequence pools. In this case the chips remain in the pool, and players will continue to add further chips before each deal even though they are not empty. If an Ace, King, Queen, Jack or Ten is turned up by the dealer as the pay suit card, then no one wins the pool corresponding to that card, and it is carried over to the next deal and added to in the same way. In this stage, players bet on who has the best set of cards of the same rank. The betting process is known as Pochen. Any set of four of a kind beats any set of three of a kind, and any three of a kind beats any pair. A set of higher ranking cards beats a set of the same number of lower ranking cards. If two players have pairs of the same rank, the pair containing the card of the pay suit is better. Example: 8-8-8-8 beats K-K-K, which beats 9-9-9, which beats Q- Q, which beats Q- Q if diamonds or hearts is the pay suit. Note that the only combinations that are allowed here are pairs, triples and fours of a kind, and only the best combination of each player is compared. If you have two pairs you only count the higher one. If you have a triple and a pair your hand just counts as a triple (there is no such thing as a "full house" in this game). If all your cards are different ranks, you are not allowed to take part in the Pochen at all. When the bets are equal, each of the players who has stayed in shows the combination (pair, triple or quartet) on which they were betting, and the owner of the best combination takes all the chips that were bet and the contents of the Pochen pool. If everyone passes, the contents of the Pochen pool stay there and are added to before the next deal. If only one player bets, or if all players but one drop out during the betting, then the only bettor naturally takes the Pochen pool and all the stakes, having shown a pair or better to prove entitlement to win them. I have not seen explicit rules about betting limits or what happens when players do not have enough chips to equal another player's bet. Since Poch is nowadays usually played as a family game with no money at stake, this probably does not matter much. If it were played for money, it would be sensible to have a system similar to Poker, where if you do not have enough chips to equal the last bet you can stake all your remaining chips. At the end of the betting you will have a showdown against everyone who has bet at least as much as you, but if you win you only get from each of them an amount equal to your stake; you would also get the contents of the Pochen pool. The players who bet more will have a showdown against each other and the best of their hands will win the remaining parts of their stakes. The winner of the Pochen (or the player to dealer's left if everyone passed) begins the play and can play any card from their hand face up in the centre (on top of the centre pot on the board). Whoever holds the next higher card of the same suit plays it, and this continues until a point is reached where no one has the next card (because it has already been played or because it was the face up pay suit card). The person who played the last and highest card of the sequence begins again, playing any card, and again the cards are played in ascending sequence in suit. This continues until a player runs out of cards. The player who first plays their last card is the winner of the third stage. This player collects the contents of the centre pot, and in addition is paid by each of the other players one chip for each card they still have in their hands. The game usually continues until someone runs out of chips. Often this will happen when someone does not have the necessary 9 chips to place on the board when the cards are dealt. The remaining players then count their chips and the winner is the player with most chips. Any unclaimed chips on the board remain there and are not won by anybody. Often there will be unclaimed ships in the Sequence and Marriage pools. Some play that if the dealer turns up an Ace, King, Queen, Jack or Ten as the centre card, the dealer takes the corresponding pool. In that case, these pools are always won by somebody. Some play that the card turned up to determine the pay suit belongs to the player whose turn it is to receive a card in the normal dealing order. Some play that it is possible to take part in the Pochen without even a pair of matching cards. If none of the players in the showdown has even a pair, the highest single card wins. In this case it is usual to use Skat order of suits - clubs (high), spades, hearts, diamonds (low) - to break single ties, and between tied pairs the pair containing the club is higher, irrespective of the pay suit. It would be possible to play for money, giving a value to each chip. In this case, at the end of the game any unclaimed chips on the board should be distributed as equally as possible to the players, and everyone then receives or pays money according to the number of chips they have more or less than their initial supply. The following summary is based on the rules of Le Poque in the Académie Universelle des Jeux, Amsterdam, 1789. The differences from the modern German game are as follows. Le Poque is played with a 36-card pack, including sixes, when there are more than four players; three or four players use the 32-card pack as above. The Poque board has only six pools: Ace, King, Queen, Jack, Ten, Poque. At one point it is stated that the fifth pool is labelled with a Ten and a Nine, which suggests that both cards of the pay suit might be required to win it, but this is contradicted elsewhere in the text. Le Poque is dealt and played counter-clockwise; the first bet in the second stage was made by the player to dealer's right. Only five cards are dealt to each player: two at a time and then three at a time. The dealer then turns the next card face up to determine the pay suit. The remaining cards are left in a face down stack and not used, with the result that the play in the third stage is often interrupted when the next card required is in the undealt portion of the pack. The dealer takes the relevant pool if the card turned to indicate the pay suit is an Ace, King, Queen, Jack or Ten. The betting stage takes place before the players who hold pay suit cards corresponding to the pools collect their winnings. The poque pot is won by the player who has the best hand in the showdown as usual. If all but one player drops out, the surviving player can win the pot even without a pair. There is no pool for the third stage, in which the cards are played out in suit and sequence as in the modern game. The player who runs out of cards first collects from all the others a number of chips equal to the cards in their hands as usual. In addition, the player who has most cards has to pay this number of chips to each opponent. It is unclear what happens if two players tie for most cards - perhaps they share the payment. The following description, contributed by David Parlett, is based on Hoffmann: Der Meister in Allen Kartenspielen (Hamburg 1873, first edition 1810). Phase 1. From three to six players each put an agreed stake into each of the first seven of eight compartments labelled Ace, King, Queen, Jack, Ten, Marriage, Sequence, and Poch. Five cards each are dealt from a 32- or 52-card pack and the next is turned for trump. Anyone dealt the trump Ace wins the stake on ‘Ace’, and so for the other compartments. The ‘marriage’ stake is won by anyone dealt both King and Queen of trumps, in addition to those of the separate ‘King’ and ‘Queen’ pool, and that of ‘sequence’ similarly for holding the 7-8-9 of trumps. Any stake not so won is carried forward to the next deal. Phase 2. The stake for poch is then contested by vying as to who holds the best combination, for which purpose a quartet beats a triplet, a triplet a pair, and a pair an unpaired hand, the highest card settling ties. Each in turn may bet or fold. The first to bet does so by placing any stake in the compartment labelled poch and announcing ‘Ich poche eins’ (‘I bet one’, or however many). Each of those who have not folded may at their turn either fold, stay, or raise. At a showdown the best hand wins the poch, but precise details of the vying procedure are ambiguous. Phase 3. Finally, cards are played out in sequences in suit after the manner of Stops games (Newmarket, Michigan, etc.). A player ending a sequence is paid by the others and starts a new one, and the first out of cards wins one for each card left unplayed in all the others’ hands. Note: Stops games did not appear before the 16th century, and in the earliest form of Pochen the final stake was won by whoever most nearly reached a count of 31.